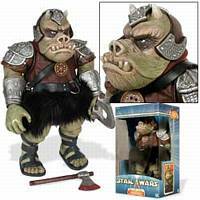 Description Of Item: This highly detailed Gamorrean Guard 12-inch Deluxe Action Figure is authentically sculpted with molded shoulder armor, helmet, cloth and fur garments and sandals. Features two removable heavy-duty axes. Fully articulated, this first-ever recreation of the Gamorrean Guard in the large 12 inch scale is a perfect addition to any collection.